This Felt Wall Clock from Sebastian Herkner is a stylish addition to any home or office. Featuring gray felt with orange hands, the colors pop to add an accent to your wall. The clock utilizes Japanese quartz movement for silent function. It's constructed from 60% PET recycled materials. Sebastian wanted to make this clock have a distinctive nature, but with a message. The PET felt offers sound dampening properties and provides a non-obtrusive aesthetic. 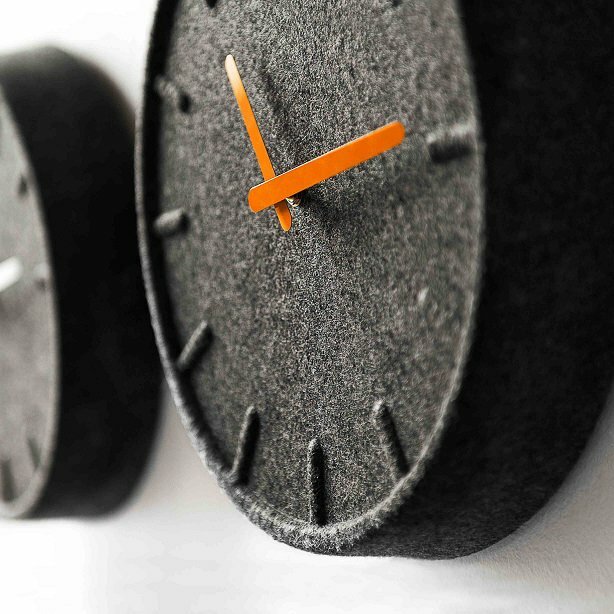 The felt wall clock is powered by a single AA battery (not-included) and is designed to last for years. The clock has a 5 year warranty through the manufacturer. Each clock measures 13.8 inches by 2.7 inches by 13.8 inches and weighs 14.1 ounces.